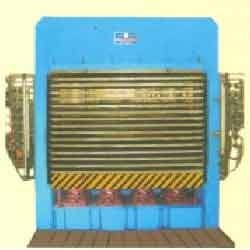 The Jet Ventilated Roller Veneer Dryer are available in different models as per the production requirement by addition & deduction of different section Decks. 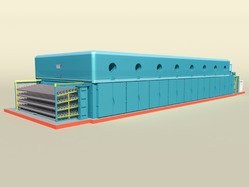 The machine has compact - Drying chambers- called as section along with multiple Double Roller Veneer Feeding Decks and cooling section, fitted with Aluminum Axial Flow Fan attached with special blower housing, Hearing Coils with extra - wide fins, Double jet Nozzles Jet Box for top and bottom of each deck throughout the length of the dryer and complete with Motor, control panel, Dyne drive/ A.C Drive(Infinitely Variable Speed Unit), Digital Temperature Indicator; Link Chain and Gear Box. The Peeling Line is for 4ft Logs upto 400mm diameter. Very Heavy duty Machines and can peel uniform Thickness of Veneer (1mm- 3mm) thickness for any species of Timber. 6. Extended Conveyor for Veneer Collection. This Machine is popularly called as Core Composer or Core Builder. It is used to Join Small Width Veneer (Falli) and make Full Sheet of Core Veneer. Both the Edges of the Veneer along the wood Grain are cut and joined without any gap. The Veneer Pieces are held by Polyester thread with Heat Melt Glue. 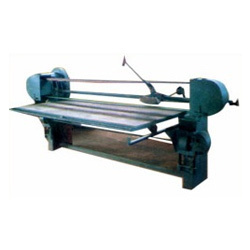 The Length of Veneer Sheet can be adjusted as per requirement. The width of the Veneer Sheet can also be adjusted from 3ft to 4ft. Core Builder for 8ft Long Veneers are also available on Request. Production Capacity: 4000 Sheets of 8ft x 4ft size per day. 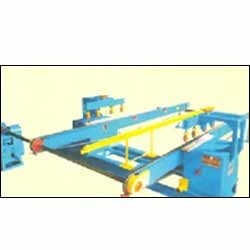 Heavy Duty Core Veneer Spindle-Less Peeling Machine for Upto 400mm dia log. Diamond Cut Cross Roller for Small left-over. High Peeling Speed along with uniform veneer thicknes. Auto Knife Changing facility along with Knife Holder reduces Knife Changing time. Knife Head Slides on high quality Linear Guide for accurate movement. Automatic Tail Veneer cut & Left-over core Dropping System. Machine Runs with Servo Motor. We are one of the acknowledged names in the market that own distinct identities for their expertise in manufacturing, supplying and exporting Glue Spreader Machine. We provide turnkey solutions to our clients by providing them customized Glue Spreader, which are diligently designed by the experts.We provide turnkey solutions to our clients by providing them customized Glue Spreader, which are diligently designed by the experts. 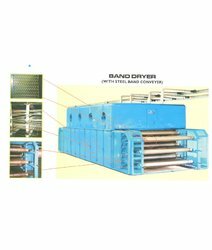 Continuous Conveyer Dryer or Band Dryer Machine is ideal for drying Sliced / Peeled Decorative Veneers.PF Resin Impregnated Veneers, Bamboo Hat I Curtain etc. The machine has Stainless Steel Bands or Conveyers for rust-free operation. Each deck has a set of pressing Band to keep the dried material in portion and prevent wear and tear. Double set of jet Boxes provide uniform drying all along the length of the Dryer. The Dryer has extended Feeding Section to enable proper arrangement of the materials during feeding. The Dryer is supplied with specially designed Alloy Fan and Dy no Drive for variable feed speeds. We have earned the repute of an eminent manufacturer, supplier and exporter Peeling Lathe Machine, which is hugely popular among clients for its high peeling capacity. It is carefully designed by the experts in confirmation with the international quality standards and hence, we are able to perform up to the expectations of the clients. Easy to install and operate these machines are widely demanded owing to user friendly application and long functional life. We are one of the preeminent names in the market that manufacturer, supply and export Glue/Resin Mixer Machine at affordable prices. Our Glue Mixer is designed, incorporating unique machines and tools that ensure its high performance, reliable results and dimensional accuracy. Respected patrons can avail this range of mixer according to their detailed technical specifications. We are one of the well-established enterprises that are engaged in providing Double End Cutting Machine in the national as well as international markets. 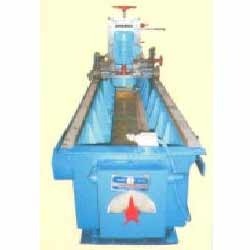 we provide wide range of Double head cutting machine. Our Double End Cutting Machine is high on demand among clients. These machines operate on high speed and find extensive usage in the fabrication of paper and cores for paper, yarn and tape winding, textile take-up bobbins and composite containers. We are considered as one of the prime manufacturers, suppliers and exporters of Veneer Clipper, which is fabricated using premium quality raw material. 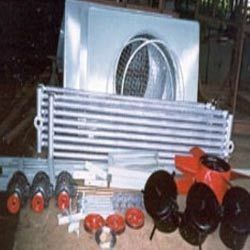 We design these machines under the keen supervision of experts, adhering to all the industry quality standards. These offered products are available with us in different sizes and specifications suited to the multifarious demands of the clients. We hold expertise in offering Guillotine Jointer Machine, which is precision engineered using high graded materials and latest technology. The Guillotine Jointer is fitted with knife, magnetic break and electrical knife locking system, reduction gear box, motors, starters complete. Well selected high grade materials are used by us to fabricate this range.Complying with defined industrial standards, these Mechanical Shearing Machine deliver long lasting operations. 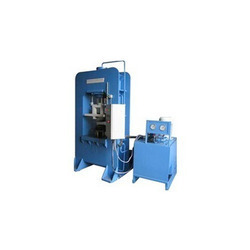 Being one of the eminent names of the market, we are involved in proffering Hydraulic Press, which is vastly used for stainless steel sink and automobile industries. 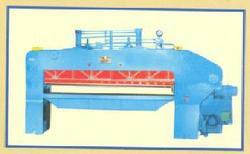 To meet the varied client demands, these presses are made available in multiple specifications. These efficient presses are tested on multiple quality parameters before handing over to the customers. 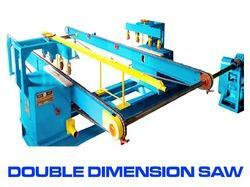 Double Dimension Saw for Plywood. Block Board & Flush Door with chain feed auto conveyor on both sides and self mechanical pressure system from the top for continuous cutting of boards & doors. One side along with side-arm of the machine will be fixed and other side (right hand side) will be adjustable for increase & decrease of size. Knife Grinder Machine with sophisticated Cup Grinding Wheel. having fabricated body, fitted with heavy duty C.I. Seasoned Knife Holding Bar with Auto Grinding Degree Adjustment System. Automatic To and Fro stroke with auto grinding arrangement, complete with one 0.25 HPA. C.,440 Volt coolant pump, one 7.5 HP 2.900 RPM, 440 Volt. A.C.Vertical Grinding Motor and one 2 HP 1440 RPM, 440 Volt AC, Grinding Carriage Traveling Motor.Starters.gear box.and main switch. We are trusted by clients for designing Belt Sanders Machine, which is a technically advanced machine, used for sanding 8' x 41 sheet with dust exhausting blower. It is a heavy duty device that is sturdy in construction due to its cast iron body that helps in eliminating unnecessary vibrations and gives a better polish on the surface of boards. Highly recommendable for repairing jobs, it is provided with trolley and 5 H.P. 1440 R.P.M. motor as well. We are the one of the renowned manufacturers, suppliers and exporters of Seasoning Kiln Machine that is designed, keeping the industrial requirements in mind. Our Seasoning Kiln is designed by the experts, using technologically advanced equipment and tools in the most precise manner. Our Seasoning Kiln is designed by the experts, using technologically advanced equipment and tools in the most precise manner. 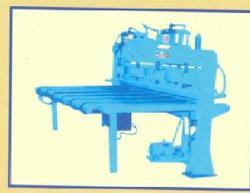 We offer Commercial DD Saw, which is repetitively demanded by clients in domestic as well as foreign markets. It is one of the highly acknowledged machines that are suitable for cutting and have the capacity up to 8' x 8' sheet. It is also equipped with 2 Nos. 5 H.P. 2900 R.P.M. Motor and top pressing rollers that help it in providing excellent performance. We offer customized solutions as per the specifications narrated by the clients. These Multi Day Light Hot Press Machine are ideal for making Plywood, Bamboo Board. Particle Board and other composite boards.The structure is fabricated of Steel plates as per the pressure capacity. For higher pressure capacity Hot press Window-Frame structure is made.Hot platens arc made of solid MS plates with drilled holes for Steam Oil Flow. This gives uniform temperature across the plates. We are proficient in manufacturing technically superior Pneumatic Veneer Clipper Machine, which is compliance with the prevailing industry standards. This is precision engineered by using premium quality components and metallic alloys and are highly durable, corrosion resistant and sturdy in construction. The offered lathe machine is highly appreciated in the market for its features like sturdy construction, high performance, less energy consumption, low running cost and longer service.